The current government shutdown endangers the food safety of U.S. citizens in real and tangible ways, according to Edgar Asebey-Birkholm, a partner at law firm Roetzel and manager of the firm's FDA Practice Group. Asebey-Birkholm adds that the shutdown will also have a negative economic impact for companies that rely on FDA for registrations, approvals and releases of the products they seek to place in the stream of commerce. The Department of Health and Human Services (HHS), of which the Food and Drug Administration (FDA) is a part, recently published "Contingency Staffing Plan for Operations in the Absence of Enacted Annual Appropriations." Essentially, this plan is the SOP for how HHS and FDA will operate under the current partial government shut down. Under this plan, 45% of FDA's almost 15,000 staff members are to be furloughed in the absence of enacted annual appropriations (aka "the government shutdown"). "It appears this plan has already been implemented," Asebey-Birkholm says. "No doubt the repercussions will be vast and far-reaching for FDA regulated companies." He says the impact of the shutdown will be dampened, at least in the very short term, for the FDA divisions that deal with branded pharmaceuticals, biologics, generic drugs, animal drugs (branded and generic) and tobacco, as FDA collects user fees for services and registrations related to certain activities in these areas. Accordingly, FDA will use carryover balances from previously collected user fees to continue funding functions in these areas, until those funds are depleted. In contrast, no such user fees exist with regard to foods. 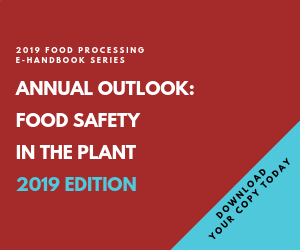 Asebey-Birkholm says that due to effective lobbying by the industry, user fees were removed from the final version of the Food Safety Modernization Act (FSMA). Accordingly, functions such as food facility inspections, inspection of imported foods, follow-up inspections after implementation of corrective action plans (CAPs) and review of petitions for removal from Import Alert will most likely all suffer due to the government shutdown. "In real terms, this means private companies that have dealings with FDA will begin to suffer immediately, as these government operations appear to have ceased entirely," he says. "If your company requires an FDA inspection before it can re-initiate operations, that inspection is likely going to be delayed until further notice. FDA teams that review submissions or petitions from companies before those companies can sell product to consumers will also begin suffering delays immediately." These include programs such as FDA's Division of Import Operations and Policy's (DIOP) review of petitions for removal from import alert as well as notification programs such as those dealing with infant formula and Generally Recognized As Safe uses of substances programs. Edgar Asebey-Birkholm can be reached at easebey@ralaw.com or 954-759-2754. The law firm is at www.ralaw.com.